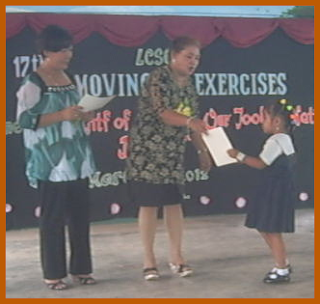 Happy was Stephanie as she went up to the stage to receive her certificate of completion from her school principal. That day marked the completion of Stephanie's kindergarten education from La Carlota South Elementary School 1, Preschool in a simple, austerity moving-up exercises program inside the covered court of the school. Stephanie Gyn Jaud is the youngest daughter of our 3rd daughter, Gynrey Camporazo-Jaud. Panie as we fondly call her, is a very smart 5-year-old kid. Nearly 200 kids finished their one-year preschool classes. Those who had excelled academically were recognized and given ribbons. And there were also some pupils who were recognized on their exemplary behavior and attitude during the school year. 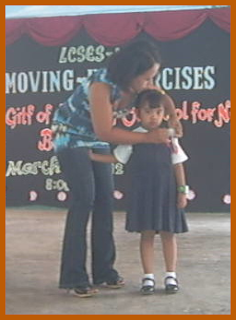 Panie was recognized as active and friendly pupil in their class. Her mother wanted me to pin those ribbons for her, instead she misbehaved and tears started to trickle down her cheeks. Well, I've no choice. I didn't insist. Instead I just acted as her official photographer. Her grandmother, Rebing, had prepared something special for her graduation presence, and gave it to her after she received her ribbons of recognition. When the 2-hour program was about to finish I left them for a school related job to do. I was surprised upon going home, when Panie accosted me, hugged and gave me a kiss. "Tatay" (father) as she used to call me rather than "lolo" (grandfather), "Nanay" (as she was used to call her grandmother) has given me a wonderful gift, a beautiful coin purse with a money inside, some chocolates inside a handy bag. Thank you, Tatay!" I grabbed the opportunity to talk to her and ask her why she didn't want me to pin the ribbons for her. 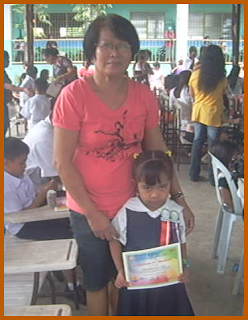 She smartly replied, "Nanay o tatay ang nagasibit sa mga ribbon sa mga bata kag indi ila lolo." (It is the children's mother or father who pins the ribbons for the pupils and not their grandfather.) I agreed with her so as not to embarrass or hurt her. Panie, a very practical and smart kid. I remember when her mother told her that she should practice reading or else she won't pass their class. She should master reading or identifying the alphabets and numbers. She agreed to be tutored by her mother, but not the alphabets reading. She insisted to be taught to read in words and in sentences or paragraphs instead. For ABCs are boring, she reasoned out. "Panyang!" - the name called by her grandmother when Panie becomes naughty, recalcitrant, and annoying. Congrats! Not only to her but to her parents too. Hi Sir. I must commend you for your blogging passion. My lola should do the same thing as yours, if she had not been inflicted with Alzheimers. Proud lolo! Congrats Panie :) Keep up the good job. Awwww conrats! I'm sure she will be a star in her own way! Lolo Gil is very proud of little Panie though she cried when she learned that he will be the one to put the pin. Maybe she saw and heard from her classmates and teachers that the one who should put the pin is either their mom or dad. Wag na tampo lolo! Ha ha ha! Panie is so cute! Aaw, congrats! It's gets better every graduation!